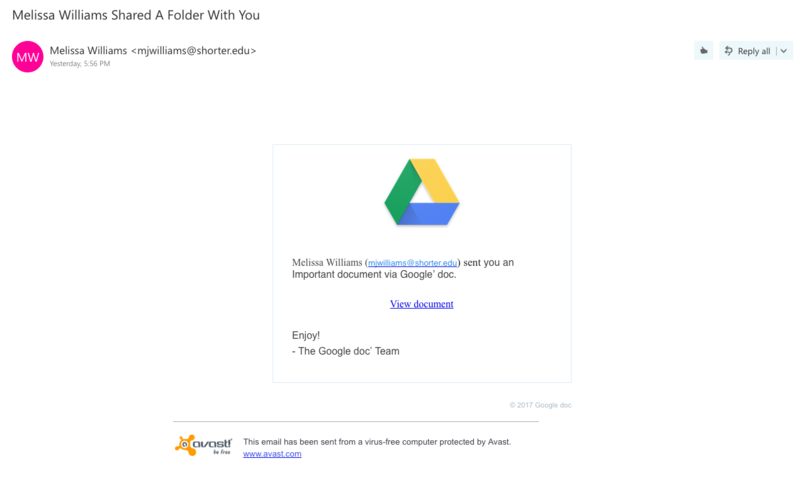 Chattanooga State Technology has become aware of a new e-mail phishing scam that has been going around. In a nutshell, the attack invites you to give access to your Google account through a legitimate-looking e-mail request to share a Google doc, and most likely will come from a legitimate-looking e-mail address (see the screenshot at the top of the page). If you receive a message of this type, DO NOT CLICK any links, DELETE the message immediately. This will ensure that you don't compromise any campus or personal information.